The past 2 weeks, we have been going to Malaysian restaurants in UK, something we rarely do! (Rarely here means probably once a year) I cook everyday during the weekdays and on weekends we usually eat out (chinese, ie HK-style or Italian/Brit) but we seldom ever do Malaysia, I guess we don't have much craving for M'sian food (I only crave for Asam Laksa, something I could NEVER cook). 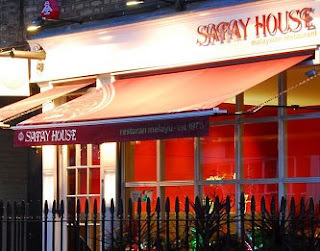 But 2 weeks ago, Meng's colleague booked a place for us in Awana "The finest Malaysian restaurant in London SW3". She booked via toptable, where we get 50% off the total food bill. I had been craving for satays because the ones on its website look so tantalising! The decor of the place is what you'd expect from a posh restaurant - immaculate & tastefully designed interior reflecting the Traditional Kampung-style Teak-house and alot of dark wood with some traditional malay furniture/instruments dotting the restaurants : Gongs, silk panels along the windows, etc. It was a party of 6 adults with 1 baby (guess who?). We ordered generously, except for Amy who shared the main course with her husband. Food portion was ok, albeit very small for satay (I ordered corn-fed chicken : 4 skewers for £8). Staff were attentive but yet not intrusive (you know sometimes some waitress/waiters can be a little too enthusiastc and come around every few 10mins to asks if everything's fine? Well, I find it a little intrusive). If I remember correctly, everyone ordered coke (except Amy who had plain water and me who ordered an alcoholic drink). The bill came up to £120 including drinks - imagine if we had to pay full price for it! Nevertheless, the food was reasonably good. The week after, SIL Alicia asked us for lunch and she recommended Japanese but a quick check and it seems the restaurant she recommended (I read alot of rave reviews about it) isn't open for business on Sundays. She suggested an alternative - Satay House which is located near to her apartment. We picked her up on the Sunday and headed towards the restaurant, got an off-street parking relatively easy nearby and went in. We were seated downstairs which is good because it was pretty packed upstairs and SW wouldn't have much space to create havoc stretch her legs. Again we ordered generously from their menu : Satay (this time more servings than Awana), their Ayam Goreng Berlada (SPICY! Yummy), a squid, a fish, Kangkung Belacan (can't do without this eh?) and rice. Our only qualm : The rice serving which, at £4/bowl which you probably need 2 bowls for the 3 adults is HEFTY! Just too expensive for a bowl of plain rice to go with your dishes. I would suggest to them to charge fairly because afterall, what is M'sian eating (ordering dishes to be shared) without rice? Overall, the food is pretty good (Authentic Malay cooking here) and price is very reasonable. We would probably return if we ever crave for M'sian food. Two weekends in a row having M'sian food. Hmmm... what's next?? Oh man! What kind of special rice do they serve? I think very expensive lor...RM600 can eat here for....a very long time!